G&W’s range of Ceramic Clays has been selected to give maximum benefit in your particular ceramic/ refractory process. Mineralogical, chemical and physical properties provide individual green strength, plasticity, fluxing and colour characteristics. Moderate plasticity, high alkali content. 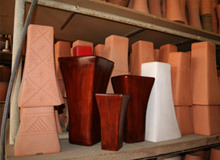 Terracotta colour, improved fluxing and fired strength. Good plasticity, improved green strength.